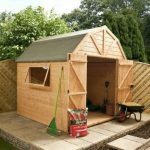 Providing your garden with a large and secure structure which can store many different things, the 10′ x 6′ Traditional Apex Security Shed is one very attractive looking and strong feeling shed which can take care of all your storage needs. Offering a lot of space inside, this is not only going to help you keep your belongings organised and make sure they are no longer cluttering up the garden or house, but it is also going to offer protection from the rain and also any thieves. Security is what this is all about and thanks to a strong door, very robust design and hard to look in windows, security is never going to be a concern for anything you place inside of here. While this has a very tough and secure look to it, it is also made with materials which can back this up. A very strong frame supports the tongue and groove shiplap cladding. The floor and roof are very solid and due to being made with tongue and groove boards comprised from redwood they are incredibly strong. Those small windows give the shed a very unique look and they also make this one of the most private sheds you can buy. 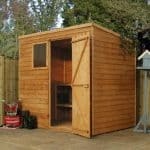 The good sized, 10′ x 6′ Traditional Apex Security Shed offers your belongings a whole lot of security from thieves and protection from bad weather. This is one of the larger sheds from Treetops Traditional, making it perfect if you have a whole lot of stuff you need to store. The depth is 10 feet and the width 6 feet. 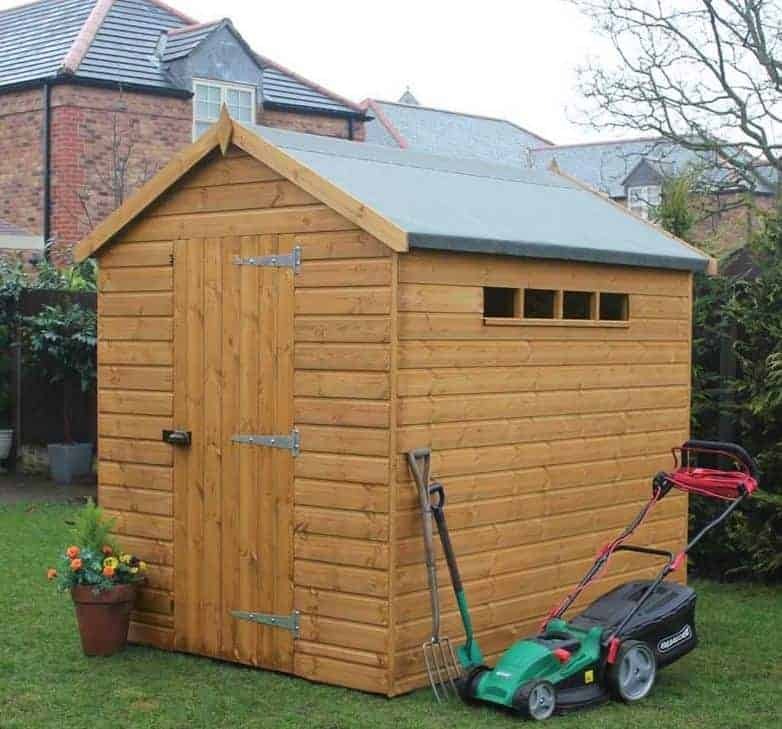 This we feel should be more than enough room for a number of things like a mower, a few bikes and the shed is even large enough that you could actually use it as some kind of workshop. The height of the shed is one of the more impressive things about it as the ridge height is 7 feet 8 inches. Most other sheds have an eaves height of around 5 feet 8, but this one here is a good few inches taller at 6 feet 1 inch. 12 mm tongue and groove boarding is covered with roofing felt to provide a roof that is not only going to be able to keep out the rain, but is also strong enough that a whole lot of snow could sit on top of here and not have any kind of effect on the roof at all. The high quality of the roof is actually something that did take us by surprise, but it was a very pleasant surprise. The whole shed is made with some amazing redwood and the walls use it to great effect. Treetops Traditional have used their 12 mm thick, tongue and groove shiplap cladding for the walls and it has a very nice look to it. Treetops Traditional use this type of cladding because of the huge amount of protection it offers from the rain. Honestly there is no way any rain is getting inside here and wrecking what you have stored. The framing behind the tongue and groove shiplap cladding is going to make this a shed which is going to last for a very long time. The frame has rounded edges and at 44 mm x 27 mm, it really is one very robust frame that will give the structure a sturdy and tough feel. While it is very easy to overlook a frame, we can assure you the one inside here is going to do its job incredibly well. The flooring inside the shed is going to allow you to store many heavier items and not have the floor start to weaken or feel like it could give at any moment. The reason for this is there are 12 mm tongue and groove boards making up the floor. This is strong boarding which we feel will make you feel very comfortable walking around inside the shed as it will have a very sturdy feel under your feet. Treetops Traditional do give you a free treatment, but it is only a basecoat treatment. This is fine for delivery and installation, but you must treat the shed yourself soon after construction. Annual treatment should be applied to ensure the wood stays well protected. 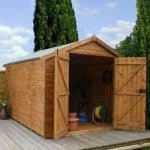 The 10′ x 6′ Traditional Apex Security Shed comes with a one year guarantee that protects you against rot, decay and any issue you may have with the materials. There is one very secure door on here that is a good, 6 feet 2 inches high and 2 feet 6 inches wide. Held in place thanks to some very heavy duty hinges, the door is not going to sag or show any signs of weakness. In keeping with the security theme of the shed there is even a padlock protector on the door. This line of sheds has some of the most unique and interesting windows we have ever seen. These small windows are designed to let in light, but make it very hard for a nosey neighbour or a person up to no good be able to see inside. They are made with very strong horticultural glass and will certainly not encourage people to come and try to look inside. Providing security is what this shed is all about and we do feel that it does just that. The door is very secure and it just has a very sturdy and tough feel and look to it. 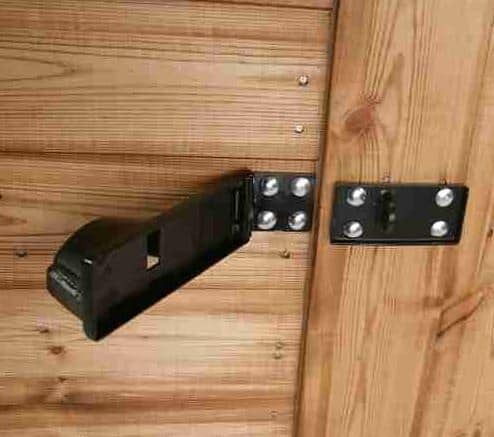 We do really like that padlock protector which is on here, but amazingly there is no padlock included with the shed. We know that a padlock is cheap, but it still would have been preferable for them to include one. This is one private shed and those small windows certainly do not make it easy for a person to see inside. There really is not anything you need to do to this shed in order to improve the privacy it offers. The idea of this shed is that it kind of blends into the garden and is not really noticeable. But if you do want to give it a bit more personality then we suggest picking a wood treatment that is a little bit brighter. When it comes to extras there are a couple for you to think about. First of all there are a set of wooden floor bearers which will give the floor a bit more protection from the ground below it as well as giving it a little bit more strength. These can be added at an extra cost of, £40.99. 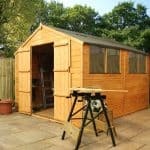 Also if DIY really is not your thing then for an extra £89.99, you can have the shed installed by professionals. Treetops Traditional know how to make a very high quality shed. And thankfully they also know how to make one that is very fairly priced. While you will have to treat the shed after construction and also look after it during its life. If you do so then this is a shed which is easily going to provide you with at the very least 20 years of use. 10 x 6 we feel is a very good amount of storage and will make it so this can be used for a workshop or just for basic storage. While this is one very secure and rather large building, we do think that it is actually not too hard to build. The average time to build a shed of this size is around 2-4 hours. There is always the installation service if you do not feel comfortable building the shed yourself. At a couple of pence under £650 this really is one fantastic deal consider the size it is and also the materials used in its construction. Final Thoughts: We really do like what Treetops Traditional have done with the 10' x 6' Traditional Apex Security Shed. 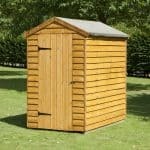 We feel if you want a large space to store a whole bunch of things then this is a shed you have to seriously consider. The style of the shed is just so unique and it really does have a no nonsense kind of look to it. The materials used make this so secure that you will be more than happy to store items that are expensive in here. 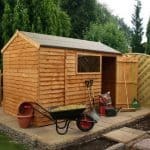 In all this really is an impressive shed it offers you a lot of security, is a fantastic size and it is being sold at a very reasonable price.